INDIANAPOLIS -- A bloody 24 hours in Indianapolis ended with four people dead by Thursday morning, pushing the city to its 100th criminal homicide of the year. The day began with the discovery of Terrence Fields’ body in the Meadows on Indy’s northeast side. The 35-year-old was found slumped over next to a car with multiple spent cartridge casings lying around him. IMPD officers determined it was likely a murder – just the second this year in a small neighborhood that nevertheless saw five people killed in 2016. Just after noon, police were again called to a suspected homicide scene. This time they found a 64-year-old woman shot inside an apartment near 21st and Arlington. The woman’s granddaughter, 22-year-old Kaycee Anderson, was arrested a short time later as the primary suspect in her grandmother’s murder . Police said Anderson also attempted to shoot her mother earlier in the day, but missed. Just as IMPD was announcing Anderson’s murder, officers were being dispatched to a third death investigation after a person was found dead near 10th Street and Grant Avenu e. They were identified as 40-year-old Keith Willaims. Then, at 3 a.m. Thursday, downtown district officers heard gunshots. A short time later they discovered a man fatally shot underneath the South Street Bridg e on Meridian Street. He was identified as 34-year-old Johnny Woods. The Grant Avenue murder was the ninth of the year for the Near Eastside – the neighborhood that saw 2016’s 100th murder and the neighborhood that, at 24 murders, wound up the city’s deadliest last year. Despite those dubious distinctions, the Near Eastside is poised to see a drastic drop in overall murders this year as it prepares to enter October with 15 fewer murders than last year. The neighborhood’s fortunes are emblematic of violence in 2017 as a whole – a year in which every positive headline about violence has been met with a negative one. In May, Indianapolis went 20 days without a murders – its longest such streak since 2015. That was followed just weeks later by a 14-day stretch in which 16 people were killed. On Sept. 10, Indianapolis passed the mark that meant it would, for the first time in in at least five years, see its 100th-homicide come later than the previous year. There was no time to celebrate that milestone, though, a s it came in the middle of a four-day stretch in which six people were killed , including two 18-year-olds, Geordyn Owens and Jonte Williams, and 13-year-old Matthew McGee. 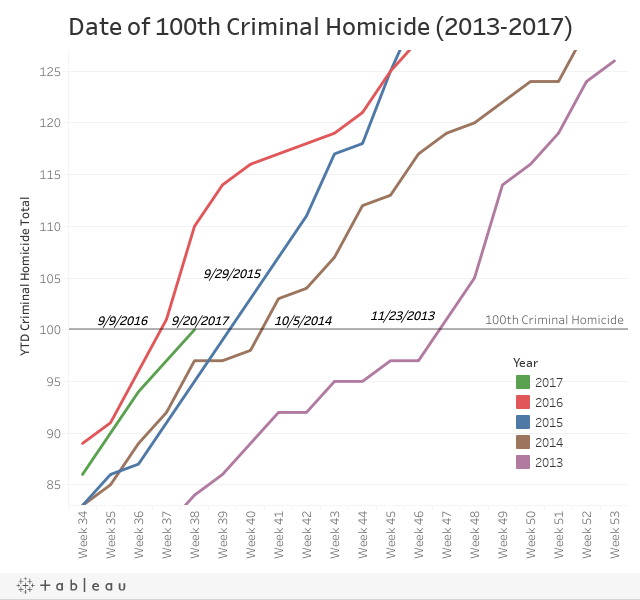 As it stands now, 2017’s 100th murder came 11 days later than 2016’s, but still nine earlier than 2015. At its current year-to-date homicide rate, Indianapolis is on pace for 137 criminal homicides in 2017. While still ranking among the deadliest years in city history, that would be the lowest number since 2014 and the first time since 2010 that murders went down year-over-year. Even that projection must be tempered, though. Since at least 2014, Indianapolis has seen an increased number of homicides during the second half of each year. If murders instead continue at their post-June pace, Indianapolis is on pace for 146 murders. That would place 2017 as the second-deadliest year in city history, behind 2016. With three months left in the year, 2017 has already seen twice the number of juvenile murder victims as 2016. Last year, four people under the age of 18 were murdered in Indianapolis. As of this writing, eight people under 18 have been murdered in 2017. All but one of those victims, 1-month-old Lamont Findley, were killed with guns. Those victims include 14-year-old Anthony Lee Hughes Jr., who was killed in January at a Popeye’s Chicken on the west side while apparently trying to sell a gun. A year younger than Hughes, 13-year-old Matthew McGee was shot and killed earlier this month outside the Long John Silver’s restaurant near Castleton Square Mall. In all but two of those cases, no arrests have been made. One possible reason for the surge in youth homicides: More kids than ever before are carrying guns in the city. An RTV6 analysis of IMPD gun trace data found a 70-percent increase in police interactions with kids carrying guns over the past four years. The Near Eastside – for years the city’s deadliest neighborhood – is on track to finally see a drop in homicides. But the story isn’t the same for its east-side neighbors. Just to the south, Christian Park saw only one murder in all of last year. So far in 2017 there have been four, including the murders of Lamar Mumm and Lance Washington months apart at the same apartment complex on Pleasant Run Parkway. Further east, the Far Eastside and East Warren neighborhoods seem to have traded fortunes. The former, which ranked among the city’s deadliest neighborhoods with 11 murders in 2016, has seen a relatively low count at just four this year. By comparison, East Warren, which had only three murders last year, has had seven murders this year, including the very first two of the year: the double murder of cousins Wesam Sammour and Ammar Shatnawi at the Jordan’s Fish and Chicken on East 21st Street. In June, East Warren saw the triple murder of Mark and Keith Higgins and Jessica Carte at a home on Forsythia Drive. As of this writing, no arrests have been made in any of those murders. In Butler-Tarkington, residents recently celebrated more than two years without a homicide following a string of four murders in late summer and early fall of 2015. The news is good in Crown Hill as well, which saw four murders last year but has had only one so far in 2017. The Near Northside and Marion-Cold Springs neighborhoods are both at zero murders for the year, following two last year for the latter. The area does have one trouble spot, though. In the Riverside neighborhood, six people have already been killed this year, including a 15-year-old, Sema Jordan . 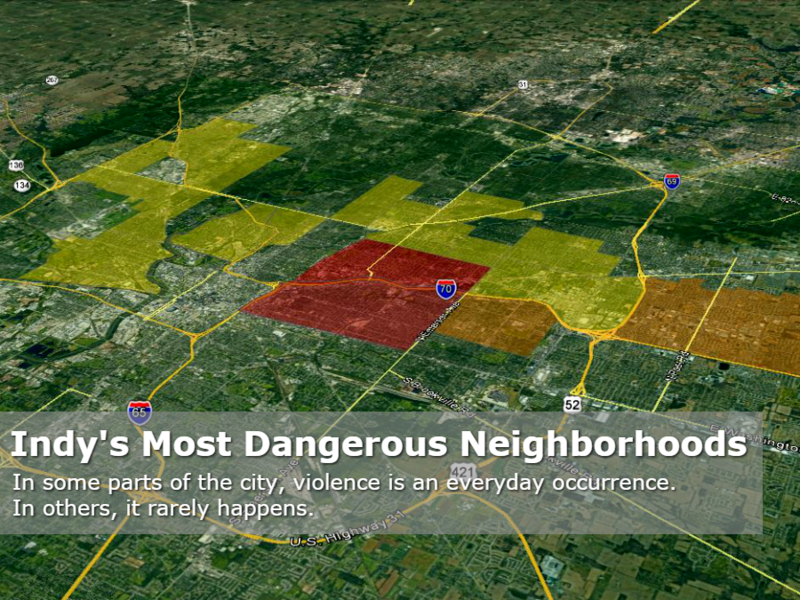 That’s twice the number of murders the neighborhood saw last year. As of this writing, the death of 45-year-old Aaron Bailey in June remains IMPD’s only fatal officer-involved shooting this year. Last month, Marion County prosecutors announced that St. Joseph County Prosecutor Kenneth P. Cotter had been appointed as special prosecutor in the case. No timeframe was given for when Cotter might decide on possible charges, or when or if a grand jury might be called. While that case remains emotionally charged, from a numbers perspective, IMPD has seen a drastic decrease in fatal officer-involved shootings over the past three years. By July 1, 2015, the department had already had five fatal officer-involved shootings. It ended that year with nine. By comparison, 2016 had only four fatal shootings, three of which came during the first six months of the year. On the other side of that equation, one of Indianapolis’ homicides this year was the fatal shooting of Southport Police Lt. Aaron Allan, who was shot 11 times while responding to a flipped vehicle. The driver of that vehicle, 28-year-old Jason Brown, is accused of opening fire on Allan for still-unknown reasons. If convicted, he could potentially face the death penalty. 2017 will almost certainly end as one of Indy's deadliest years in history. But it could reverse a seven-year trend of ever-increasing violence. If it manages that – particularly if it does so with a significant decrease in homicides in the troubled Near Eastside – IMPD, the Indianapolis City-County Council and the mayor's office will earn no small portion of the credit. In successive budgets, Mayor Joe Hogsett and the council have provided millions more in funding for IMPD – much of which has gone to correcting a long-standing under-staffing issue in the department. At the police agency, new policies started under former Chief Troy Riggs, particularly targeted social services sweeps and a return to beat policing, have sought to improve officer-citizen interactions and connect people in crime-stricken areas with the tools they need to improve their situations. On the other hand, if, even after all those efforts, Indianapolis again breaks its all-time homicide rate, as it has for two years in a row, city officials will have to dig deep for ideas to combat a rising tide of violence that has been resistant to every attempt to stem it. Jordan Fischer is RTV6's senior digital reporter covering crime and justice issues. Follow him on Facebook or on Twitter at @Jordan_RTV6 .